Carparts.com, online also at carparts.com, is committed to providing its customers with all the parts, truck parts, and auto accessories they need. Carparts.com offers a huge selection of parts for almost every car made. Among the different parts that you'll find at Carparts.com find air filters, alternators, belts, brake rotors and pads, oxygen sensors, carburetors, ball joints, clutches, and much more. Carparts.com offers the top selling automotive brands including CoverKing, CoverCraft, Averys, Dashmat, Centric, Motorcraft, Standard, CalTrend, VelourMat and so many more. 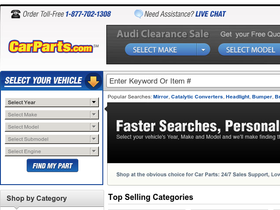 So when in need of parts for your car or truck head on over to Carparts.com to see what they have in store for you. First, be sure to stop by RetailSteal to find the best Carparts.com coupon codes, Carparts.com discounts, and Carparts.com promotions. At Carparts.com shipping rates differ according to the means of shipping used and to the dimensions of the package box. Most orders are shipped via UPS or Fedex Standard delivery however Overnight shipping and 2nd Day Delivery are available options. See website for full details, exclusions may apply. Shop at CarParts.com and enjoy 5% savings on orders $150+. Click here for code. Shop at CarParts.com and enjoy $15 savings on orders $275+. Click here for code. Act now and save $20 off your order of $300+ with this coupon code from CarParts.com. Save up to 50% off top car parts from CarParts.com. Check out CarParts.com online for their latest special offers.